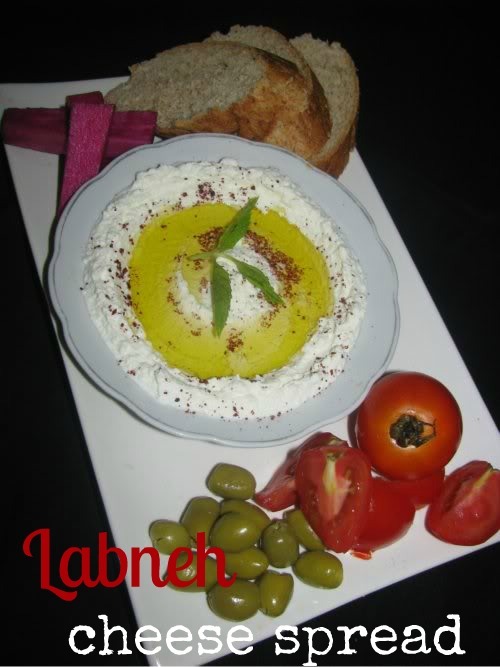 Labneh is a simple cheese made from yoghurt. And machallah labneh is very easy! Labneh may sound like it's difficult to make but all it is strained yoghurt- simply defined. But please note in some Arab countries they use raïb (soured milk), I personally do not like the soured taste I prefer yoghurt version. Yoghurt is an airy product produced by bacterial fermentation of milk. And Greek and Turkish yogurts are a more strained yoghurt usually containing the the white murky liquid on top called "whey". So Labneh is super strained yogurt, traditionally ‘hung’ in a sieve, muslin or cheesecloth for anything between a few hours and a day. The aim – to rid the yogurt of its whey, that light yellow liquid which tinges our yogurt with a faint golden hue. Very faint albeit. The result: white, soft ‘cheese’ but technically it's not a cheese since no rennet is used. It has the appearance of Philadelphia cream cheese, the calories and tartness of yogurt and a versatility that begs for it to be made and served morning, noon and night. It is really something to use and eat always! I always some in the fridge ready for breakfast or suhour. And best of all, you don’t need a recipe – it is super easy to make. There is no exact measurement needed since there isn't any cooking or baking here. So use more yoghurt to yield you more labneh.Some have whisked it up and smothered it over the top of cakes and others have filled cakes with it, others have loving served it up in bowls. Even more have gone further and rolled out tiny balls and those who want to keep it forever, smother the very spheres of creamy deliciousness in oil, lots of oil. Spoon the yoghurt out of the pots into your bowl. Add the salt (ot taste) and mix.The salt helps draw out the whey (think of cucumbers& aubergines where the salt drains them of their natural liquids). Because you may want to use this in a ‘sweet’ recipe, temper how much salt you add. Line the strainer with the muslin. The initial straining will happen quickly as the bulk of the liquid and some of the yoghurt itself will strain through the cloth and sieve into the bowl. After the initial straining (5 – 10 minutes or so), gradually bring the corners of the muslin together to form a bundle. Now either leave it in the strainer with the bowl under it OR hang the bundle on something like the inside rack of your fridge, a hook, a sturdy spoon or kitchen cabinet knob. Hanging from a hook speeds up the straining process. Hang your yoghurt for at least 12 hours and preferably 18 – 24. The longer you hang the yogurt, the thicker your labneh will be. After this time you will see the whey has been caught in the bowl below and the labneh have firmed up. You’ll find that the yogurt is smooth and thick like cream cheese. Optionally we also like to serve Labaneh with anchovies, canned tuna or sardines in tomato sauce. 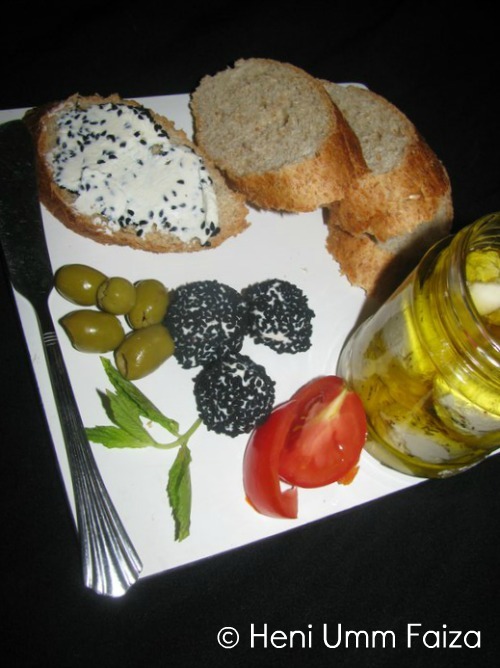 Today I will show you the Classical Mediterranean way to serve labneh. But in upcoming posts I will share more ways to enjoy this cheese! Sprinkle with dried mint, parsely and some chilli peppers (optional) and surround by olives of all choices. Serve with any flatbread or even pita chips.